There are few TV shows that can genuinely say they transcend generations, but Danger Mouse is one that safely can. First broadcast in September 1981, this cult classic was given a makeover in 2015 and became an instant hit among a whole new legion of fans. The world's greatest secret agent wouldn't be much without a decent set of wheels, and Danger Mouse's Mark IV car is one of the best out there! With a fully functioning boot and stylish pop-out wings, this mean machine also comes with an exclusive 3" figure that you can't buy anywhere else. The car is backed up by a whole plethora of toys from Jazwares, including playsets, action figures, plush and more. Young fans will also be treated to some role play products such as Danger Mouses's favourite gadget, the Shrinkatiser! 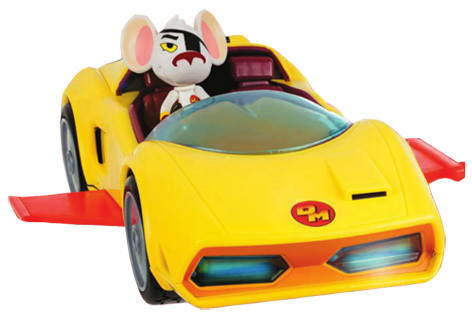 Please tell us what you think of the Danger Mouse Mark IV Car by Jazwares.